I have a heavy piCture pOlish post to share with you all today featuring all of the latest PP products : the latest December blogger collaborations and LE, the new nail care range as well as Liquid Palisade which has just made its way on the boutique! 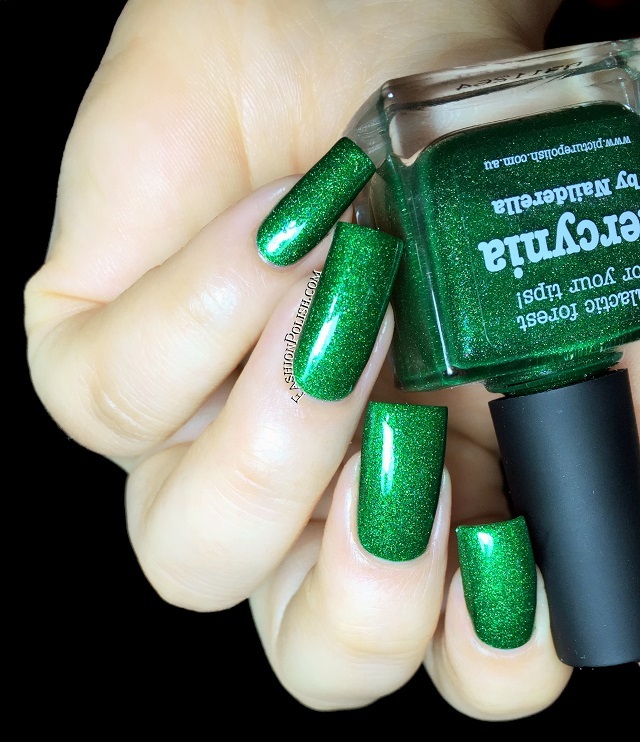 Hercynia is Nailderella's collaboration, a forest green infused with the piCture pOlish signature bijou holo finish. Great application and a 2 coat coverage. Shown without topcoat below. 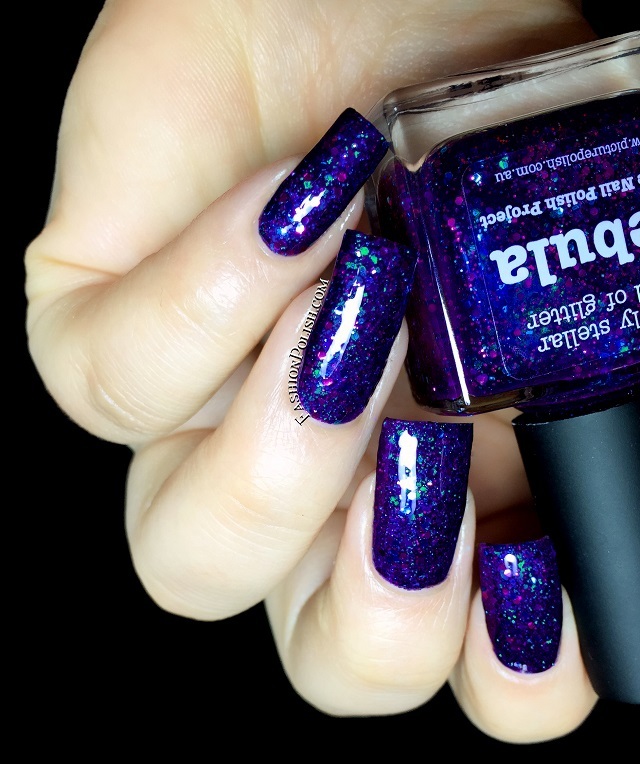 Nebula is The Nail Polish Project's collab, a midnight blue jelly based packed with different sizes of magenta and turquoise hex glitters. Excellent glitter pay off and a 2 to 3 coats coverage. I used 2 coats plus topcoat in my swatch. 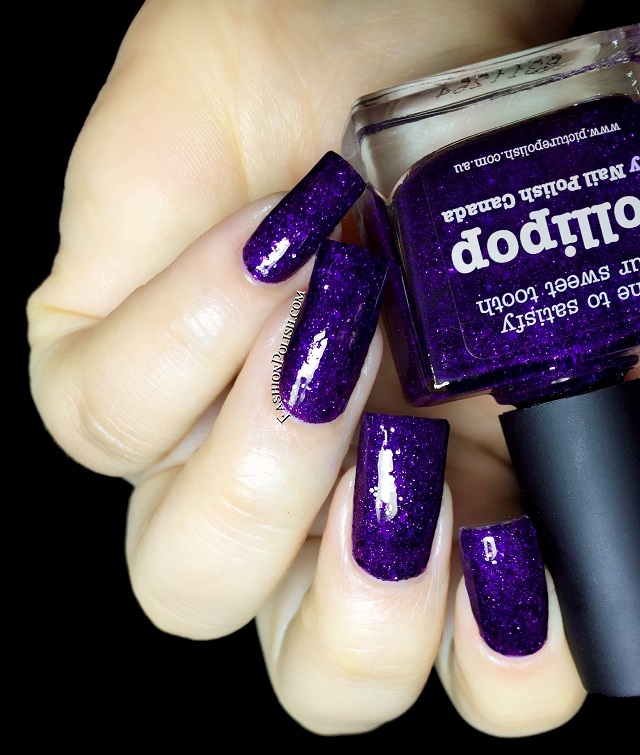 Lollipop is Nail Polish Canada's collab, a rich royal purple jelly base with a mix of lavender and magenta hex glitters. 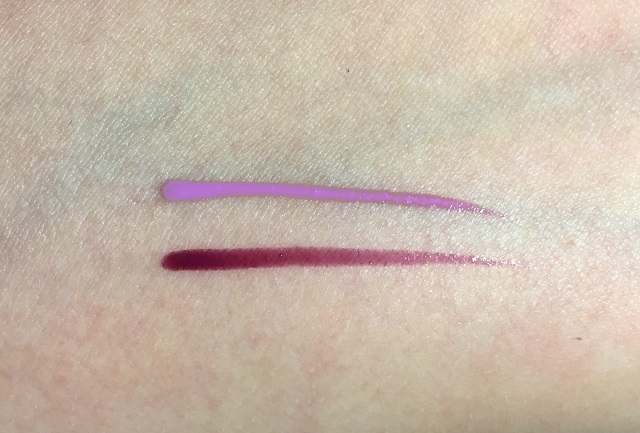 I wish my swatch could translate how vibrant it looks... I also used 2 coats plus topcoat but I'd call it a 2 to 3 coater. 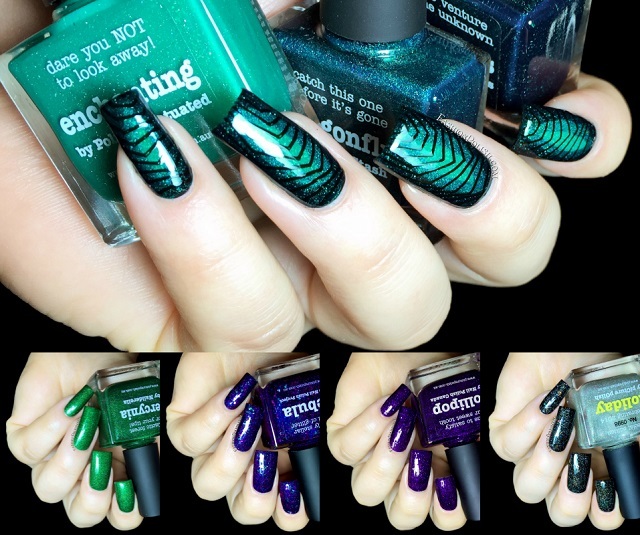 The December collaboration series also included Enchanting by Polish Infatuated, Dragonfly by Lucy's Stash and Escapades by Nail Escapades but looking at all three, I decided to include them in a nail art, rather than just regular swatches, and try out Liquid Palisade that has just been included in the piCture pOlish nail care / nail art range along with That Remover and Those wipes, the PP water based nail polish removers. Liquid Palisade is a liquid paint-on barrier that allows easy clean up and also offer infinite nail art possibilities. Mauve in its liquid state, it dries to a peal-able berry once dry. 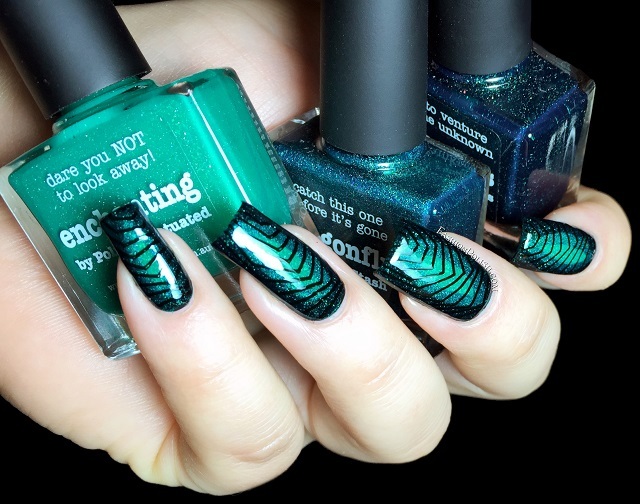 I started with 2 coats of enchanting and worked my way to the edges with Dragonfly and Escapades, creating an overall gradient, in trompe l'oeil style. 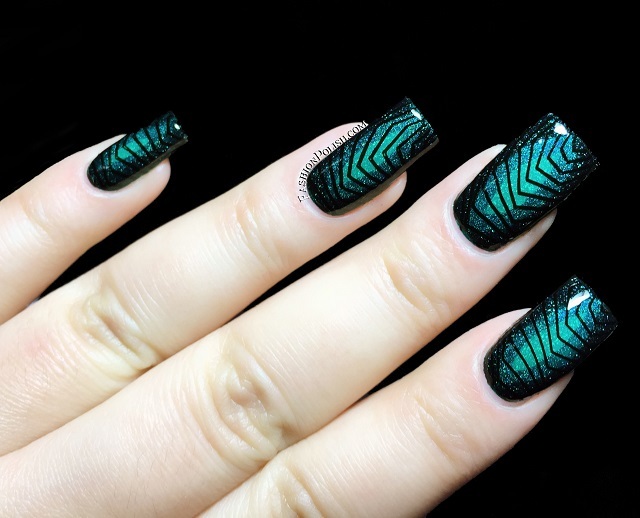 I then topped them with topcoat, protected my cuticles with Liquid Palisade, gave it a few minuted and stamped my design with black. As for That Remover and Those Wipes, I've been using them regularly before my weekly pampering manicure routine and I love them. They are water based removers so they require a little more work than regular acetone or solvent removers but they're so gentle that it outweighs the cons IMO. I still wouldn't use them during my swatching sessions or over highly pigmented colors such as red or other particularly renown stainers but they work great over pastels or medium colors. They require to rethink the entire nail polish removing process, almost feeling like a nail treatment and leaving your nails and fingers hydrated thanks to the Vitamin E and Aloe Vera that they contain. Holiday is a limited edition, numbered LE, a scattered to linear holo topper mixed with flakies, a really fun and unique combination. 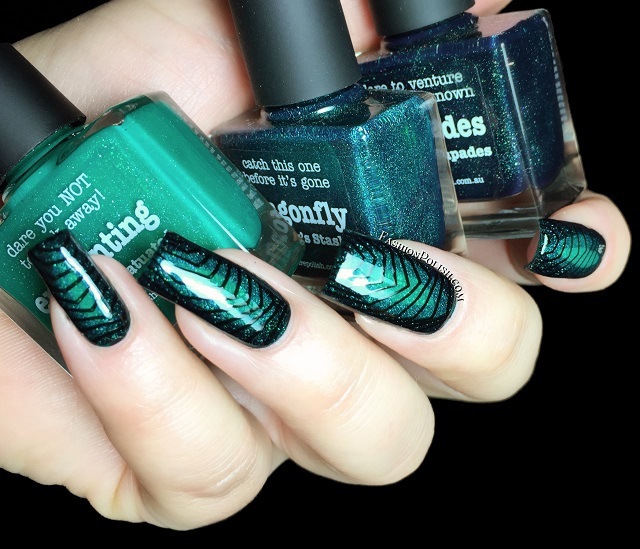 I used 2 thin coats over black in my swatches below. piCture pOlish can be purchased on piCturepOlish.com.au (internation shipping and everyday deals available) or through their International Network. Make sure to check this page for a list of etailers in your country. Nail polishes : AU$13 to AU$15.